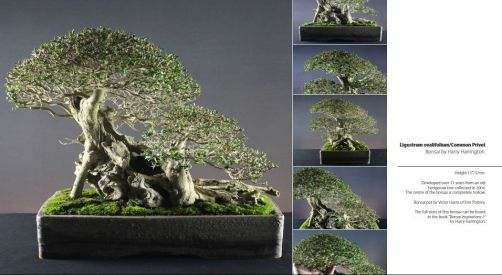 Bonsai, as with nearly all other types of cultivated plant, require moisture at their roots to survive. Without a continual source of moisture, the tree is unable to continue its life process, initially losing leaves, then branches and finally the entire tree can die. Never doubt that the quickest way of killing a bonsai is to allow the compost to dry out completely. Bonsai in the author's garden being watered automatically during the heat of the summer. However, though the effects of under-watering are immediate, over-watering a bonsai also causes ill-health. The effects of continual over-watering takes much longer to become noticeable and can often be difficult to diagnose. Established plants and trees growing in the ground have the ability to 'adjust' to their habitat and the quantity of water that is available to them. If there is not enough water available to the root system, the roots will spread out into the soil until enough moisture can be reliably acquired. Thus plants growing in relatively dry areas will have far-reaching root systems that will continue to spread out until a reliable source of moisture can be found. On the other hand, trees growing in damp conditions where moisture is permanently available in the upper levels of the soil, will tend to have shallow root systems as they have easy access to moisture. In the confines of a pot, a bonsai loses this ability to self-regulate its exposure to moisture. It is unable to govern how much or how little water it accesses. The compost in a bonsai pot is also far less stable than soil in the ground, the possibility for it to dry out is greatly increased and is really affected by the outside influences such as the weather and the surrounding ambient temperature. 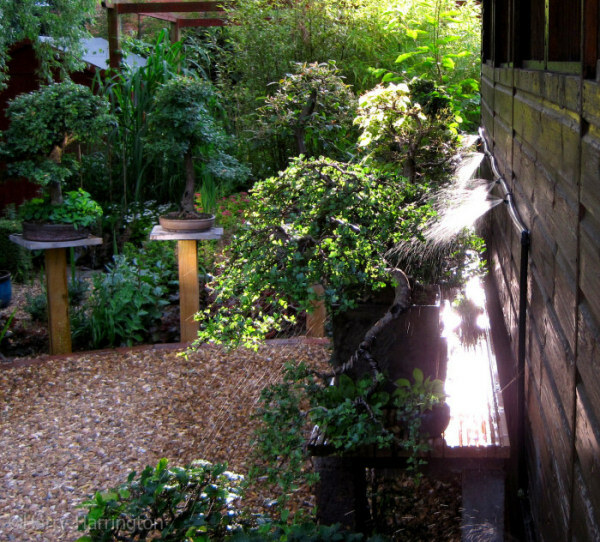 Correctly watering your bonsai is a skill itself and is not as straightforward as most beginners might expect. It is often said in Japan that it takes 3 years to learn to water correctly. It can sometimes take three years of tree losses before a bonsai enthusiast realises that their watering regime might be the cause! Plants rely on a continual flow of water to stay alive and to grow. Water is absorbed from the compost into the roots by a process known as osmosis, the water is then pulled up the body of the plant and is released into the atmosphere through the foliage. This process allows the plant to distribute vital nutrients throughout its structure. However, without a source of moisture at its roots, this flow of water is interrupted and the plant structure quickly collapses and dries out. Leaves and branch tips are the first areas to be affected, followed by branches. Finally the trunk and roots themselves collapse and dry-out by which time it is unlikely that the tree will survive without major damage. Application of water at this point is often too late; moisture can actually be absorbed out of the roots back into the wet compost in a process known as reverse osmosis. As previously mentioned, the effects of over-watering are far more subtle and can take a relatively long period of time to detect. Over-watering a water-retentive soil creates an environment for the root system that is permanently wet. Roots need oxygen to 'breathe' and the presence of too much water in water-retentive, airless soil reduces the ability of a compost to absorb air; this in turn causes the fine root hairs to suffocate and die. The immediate effect to the tree is a loss of vigour as parts of its root system are unable to grow and/or dieback. More worryingly, the dead roots start to rot. Naturally occurring bacteria are able to colonize the dead tissue and in very wet composts are able to thrive. As the root system continues to die back from the effects of overwatering, the root-rotting bacteria are able to spread throughout the root system and slow (if not completely stop) the ability of the tree to seal the remaining live root-tips. Gradually the live portion of the root system becomes smaller and as it does so is able to support less of the visible top growth of the tree. 'Overwatering' is something of a misnomer; if a bonsai is planted in a good quality/well-drained bonsai soil it is literally impossible to overwater. Root-rot is the result of a tree growing in poor-draining soil that remains wet ,and more specifically, is airless, causing the roots to die rather than the act of too-frequent watering. Foliage on the tree will start to yellow and drop; smaller branches will shrivel and die back. As the live portion of the root-ball becomes even smaller, it is eventually unable to support the primary branches and the trunk, causing the tree to die. Root-rot is often only detected at repotting time in spring. Rotted roots will be found to be black and will disintegrate when touched. The only reliable way of stopping root-rot is to cut away all dead areas of root. As previously discussed, it is important to avoid the effects of under-watering and overwatering. So how do you water a bonsai correctly? Firstly, NEVER water to a routine. Simply watering on a daily basis without first observing the condition of the bonsai soil, is a common mistake made by beginners, often following the advice of well-meaning bonsai retailers. Bonsai can indeed require water on a daily or even twice daily basis, particularly in hot weather or early spring. However, watering to a routine commonly leads to permanently wet compost. If the compost does not lose some of its moisture content between each watering, it means it is permanently wet, leading to the previously mentioned problems associated with overwatering. Instead, trees should be checked routinely (at least on a daily basis), so their water requirements can be observed and they can then be watered when they actually require it. The surface of nearly all bonsai composts change colour and appearance when it starts to dry out. With careful observation, it is always possible to tell whether or not the compost surface is dry or not. This can take anything from 12 hours to a week or longer after watering, depending on a variety of factors such as the surrounding ambient temperature, plant vigour, pot size and whether it has rained or not. In the UK, trees tend to need watering daily during the summer but with lower temperatures and increased rainfall during autumn, Winter and early spring, watering needs can change day by day. Never assume that because it has rained your tree has received enough water particularly during the summer. Often, it only rains enough to wet the upper layers of the compost. The correct time to water is when the top centimetre of the compost has started to dry out. With regular observation of your trees on a daily basis, you should be able to apply water when it is actually required. Allowing the compost to dry a little between each watering will ensure that they are not overwatered. Different trees have different water requirements, if possible, try to water trees individually as they require it rather than an entire collection en masse.